M100 was conceived and created by Palden Jenkins in 1994-95. Many friends and associates with skills and experience from earlier ventures joined in to make a formidable volunteer team. The main annual retreat, a week-long camp, was complex to run, and this rolling team did it so well that the camps have looked deceptively easy to run! Palden is a writer, book- and website-editor, educationalist, historian and social inventor. 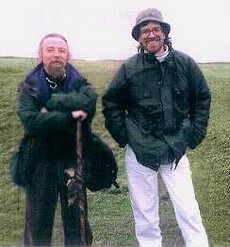 He founded the Glastonbury Gatherings in 1983 and the OakDragon Camps in 1987, both of which were precursors to this project. In the early 90s he compiled the noted book The Only Planet of Choice (1st edn, 1993) for the Council of Nine - a sourcebook for the project. His ideas on world healing are outlined extensively in Healing the Hurts of Nations, published free. He's a 1960s veteran. The impetus for the M100 project began when he was involved in student politics at the LSE. He realised that social change could not occur fruitfully without a fundamental inner change in humanity, and thus he set out on a path of transformation during the 1970s. This led him to the mountains of Wales, to death's door, to the feet of Tibetan Lamas and to the forests of Sweden. After a time of tragedy, he settled in Glastonbury in 1980, soon to start the Glastonbury Gatherings, which grew into the Glastonbury Camps. These were the seed-point from which grew many different organisations and new community and spiritual activities continuing to this day. The OakDragon Camps, started in 1987, represented a second generation of consciousness-raising camps. Palden's involvement with the Council of Nine confirmed and added to his understanding of the state of the world and what he had to do. At one point, when talking to the Nine, they said that they needed more people to work with them by practicing meditation to heal the world, Palden made an inner promise to use his abilities to pull people together into larger groups to do this. By 1994, drawing on the experience of the camps of the 1980s, he set the Hundredth Monkey process into motion, calling on old friends and new. The first M100 event took place near Malvern in England, attended by 150 people, lasting a week. 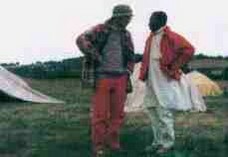 In 1995, the first M100 camping retreat was advertised, and Palden called on his many contacts to join in. The first camp turned out to be a deeply moving experience for all involved. This had not been done before: combining the empowered community atmosphere of the camps with daily meditation and group-process work, in a protected environment. Participants were informed in detail what to expect, and they were asked to conform to certain agreements which would increase group resonance and crank up the energy. What was remarkable was that, although this was quite new, participants adjusted to it well and rose to the occasion. They implicitly knew what to do. Many were also quite experienced in inner work, operating in groups and healing. It's worth reading the feedback from participants, to get a sense of what happened. An indoor gathering was held at Easter 1996 - again, a deeply moving experience. The group was now beginning to find its feet. There were two more camps and one more Easter gathering. Also, in December 1996, the Flying Squad was formed - it continues at work today.